Heard of the Persian-Arabian Ideological Gulf in Understanding? Washington DC – NIAC has protested Google’s inclusion of the politically divisive term “Arabian Gulf” on its application Google Earth. Historically, the usage of this term for the Persian Gulf has been led by pan-Arab figures such as Egyptian President Gamal Abdel Nasser and Iraqi dictator Saddam Hussein to rally the Arab masses against the non-Arab peoples in the Middle East. Last week, NIAC’s Board sent a letter to Google’s CEO, Dr. Eric E. Schmidt, pointing out the political nature of including this alternative term for the Persian Gulf on their applications. NIAC is also seeking a meeting with Schmidt to ensure that the mistake is corrected. Somehow I don’t think that including all possible names for this gulf was an unintentional error. TEHRAN, Feb. 08 (ISNA)-“No war in Persian Gulf” was the most important message that artists delivered in the 15th Persian Gulf Environmental Art Festival in Hormuz island to show both Iranians [sic] peace-loving nature and prevent distorting the name of this gulf. The sentence was designed and written in huge size on a monochromatic part of the island with good aerial look to be seen on Google Earth. This has to be the single-most innovative political protest of the new millennium: Dislike the labels in Google Earth? Write your own for all to see. I believe the think tank is behind all of this. They sit together and plot: what can we do to divide Persians and Arabs so we can concur them? Name is Persian gulf. You cannot change a historical name just because fat Arab sheiks have made big money out of inflated oil price. Lake Ontario is lake ontario, no one calls it american lake although it borders US. Gulf of Mexico is the same, CNN never calls it American gulf or the gulf. That is because Americans are civilized. But these Arab sheiks are not. Blease don’t help the uncivilized. Everyone knows it is the Persian Gulf. Do not fall into the trap. This is an attempt by the west to provoke and instigate conflict in the region so they can profit from it. They know Iraninas are sensitive to this issue and they are also well aware how the arabic gulf nations long to change the official name. The West is merely looking to create turmoil and confusion so they can come in a rob both Persians and Arabs of everything they have while they are busy fighting amongst each other. Arabs may spend so much money to change this name in Google or other motors, but it does not work. It is a part of histoy. It is impossible. How can a story destroy history???!!! Let Arab’s delight in their hallucinations! The’ve always been jealous of Iranian’s glory, prestige, and ancient civilization. Needless to say that such forged names can never materialize their wild dreams. They should know that Iran has been, is, and will be the superior power in the region.Be sure that the Persian Gulf, will continue to echo the name of Iran, this peaceful,lovely friendly Cat, this absolute glory of The Middle East.and its violent waves of anger will demolish the timid cowardly, enemies of IRAN. Falsification and distortion of history is a crime punishable by most laws in the various States, as is the case in the denial of the Nazi Holocaust of the Jews in the Holocaust. And I warn officials of the Department of Google that if there is no commitment to international laws in Google earth. I can’t understand why a reputable company like Google would do something retarded like this. This is an intentional provocation and shame on Google for mixing up in politics and bribery. I uninstalled google earth from my PC’s and will stop using their search engin. An associate professor of Ancient History at California State University, Fullerton, Darayee has launched the English language website “Sasanika”, introducing the history and culture of Sassanids. Following is the full text of Daryaee’s letter published in Rozaneh Magazine. The body of water called “Arabian Gulf” already exists, and the name is reserved for another body of water, which I teach about in my ancient history courses. In essence, what you have done is to confuse the bodies of water for the students and general users alike. In antiquity the Greeks and Romans called the Red Sea the “Arabian Gulf” (Pomponius Mela, de Chorographia, passage 72). Am I to tell my students that the National Geographic Society has decided to relocate this body of water for us? It was only with the recent appearance of Arab nationalism or so-called “Pan-Arabism”, spear-headed by former Egyptian President Gamal Abd Al-Nasser, who was hostile to the late Shah of Iran, that the term al-khalij al-arabi or “Arabian Gulf” was coined. It simply did not exist before this period! How could we go about changing names of places so whimsically based on personal preferences? The Society states that since many institutions and people use an alternative name for the Persian Gulf, then “Arabian Gulf” must be mentioned. By your logic, then Shatt al-Arab, which is the waterway bordering Iran and Iraq, known as Arvand Rud (“Arvand River”) to the Iranians for several decades must also be mentioned. But this would be historically incorrect, and I would not support the changing of names based on nationalism. By the same logic if the Iranians begin calling the Sea of Oman or the Arabian Sea the “Sea of Iran,” then the National Geographic would have to cave in and place such artificial names for these bodies of water as well. Even the island of Kish in your map is mentioned by it alternate Arabic name Qays which is almost never used in Iran and it belongs to Iran. If personal (Directorate) or financial matters govern such decisions, then I must say that I am dismayed that such a reputable organization would be pushed to create false names as “acceptable alternatives” based on unscrupulous decisions. But again, we live in a world where even names can be bought or exchanged for money. I just did not expect that the National Geographic Society would do such a thing. Rest-assured, I will have this matter discussed in our department at Fullerton, and my fellow historians in other California State University campuses will also hear about this matter. I do ask you to please cancel my subscription. Persian Gulf is part of Iran: Larijani TEHRAN, Jan. 8 (MNA) — Dr. Ali Larijani, the Leader’s representative at the Supreme National Security Council, has said that the Persian Gulf is part of Iran and the county’s interests lie in it and this will remain so. In an interview with the Tehran Persian language daily Hamshahri published on Saturday, Larijani stated that Iranians are very sensitive about the country’s boundaries in the course of regional developments. Today those countries with no access to open seas do not enjoy economic and trade privileges, but access to the Persian Gulf and Gulf of Oman has provided Iran with easy access to the world, he noted. From the Arvand river at the mouth of the Persian Gulf to the Strait of Hormuz there are eight countries with coastlines, with Iraq having the smallest coast of ten miles and Iran, with 635 miles has the biggest, and out of 130 small and large islands in the Persian Gulf, 25 belong to Iran, which are all of strategic importance for the country, he noted. Moreover, oil and gas reserves, fishing, tourism, and trade opportunities have made the Persian Gulf unique for the country, he said. The Persian Gulf is important for the U.S., Japan, and Europe due to its abundant energy resources such as oil and gas, but the significance of the waterway far outweighs these factors because parts of it belong to Iran. Pointing to the last will of Peter the Great to Russian officials, in which he asked them to gain access to the Persian Gulf’s warm waters, the SNSC member said the presence of British and U.S. forces in the area throughout the twentieth century is an indication of the strategic importance of the Persian Gulf. He said British and U.S. forces have been present in the area mostly to protect the balance of power in favor of Israel and this policy is maintained throughout the Middle East starting from North Africa to the Persian Gulf to guarantee the safe flow of oil from the waterway. Larijani, who holds a Ph.D. in philosophy, went on to say that during the rule of the last shah of Iran, the colonial powers supported the anti-Arab Iranians but immediately after the Islamic Revolution they turned to anti-Iranian Arabs and this indicates that “sowing discord” is the most favored tool of the U.S.
“The meaning of peace, stability, and progress from the Americans’ point of view is different from what we think. Peace means the security of Israel, the interests of Israel, the dominance of Israel, and even the current U.S. policy of preemptive war has the same meaning,” he observed. The former director of the IRIB television network argued that the U.S. neoconservatives are obsessed with the Cold War era and are trying to create an artificial cold war in the Middle East in which Iran is to play the role of the former Soviet Union and the Arab states are to be like the Eastern European countries with Iran trying to gain control over them. It is known worldwide as Persian Gulf for hundreds of years, no one can change this legally. This is just ridiculous! Of course it is Persian Gulf! It’s been Persian Gulf since for ever, just look through the history books. It’s always referred to as the Persian Gulf!just look through all the United Nations docs and ull see it is Persian Gulf! It has nothing to do with the arab surrounding countries. 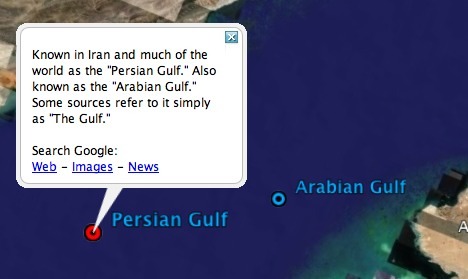 the name Persian Gulf, is a historical fact! All through history from herodotus to will durant, all of them referred to that gulf as the Persian Gulf. Funny how the world works! 9/11 was triggered by the arabs (here are heaps of evidence for that: http://sonofcyrusthegreat.zzl.org/), it was arabs who celebrated the 9/11 tragic event, at the same time Iranians lit candles big groups of ppl walking in the streets condeming terrorism and sympithiesing with the victims, yet all the western world are supporting this outragous attempt of the arabs to steal an Iranian heritage, an Iranian identity factor! just persian gulf plz remember just persian gulf plz dont try to rename this . It is a pity that you are trying to incorporate politics into geography and change history itself. The Persian Gulf has been called the Persian Gulf for thousands of years and has been accepted by the UN numerous times as the official name. There are maps that are thousands of years old. There is an 862 page book showing only old and historical maps of the Persian Gulf from 3000 B.C. to 2000 A.D. This goes back 5000 years. The Greeks, the Romans, and the Persians, among others referred to this area as the Persian Gulf. It may have been called Sinus Persious, Mare Persicvm, Gulf Persique, Khalige Fars (in Persian) among other names. It is a crime to change a name in an attempt to change history. This evil act must be stopped immediately. . Please help stop the changing of history. This is truly a racist crime. In the old maps “Sinus Persicus” is “Persian Gulf” and “Persicum Mare” is “Persian Sea”. Although the Persian Gulf is connected to the Persian Sea which then leads to the Indian Ocean however the Persian Gulf ( Sinus Persicus ) and the Persian Sea ( Persicus Mare ) are two different maritime regions that should not be mistaken with each other. Never give up, my Iranian brothers and sisters. Let the WORLD know that the FILTHY Brits are behind this DISTORTION campaign. Those bastards responsible for this British Divide-and-Conquer game are two British warmongering fascists – Charles Belgrave and Roderick Owen. The FILTHY Brits want war and destruction. Evil warmongers like Gamal Abdel Nasser and Saddam Hussein are responsible as well. But, they did NOT start the conflict. It’s the British scums that started the conflict! Let the world know that Charles Belgrave and Roderick Owen are behind the fabrication campaign of the legal and historical name, Persian Gulf! Always when you talk about the obvious distortion campaign of the legal and historical name, Persian Gulf, let’s NEVER forget to mention those two bastards responsible for it – Charles Belgrave and Roderick Owen. I welcome all my Iranian brothers and sisters to combat identity theft and raise awareness about how the FILTHY British warmongers are working hard to attack our culture and heritage. Yesterday was National Geographic today is Google and tomorrow who knows?! Don’t insult the Arabs and concentrate your effort on the cause. Your full attention should be on the agenda behind this name changing and your reaction should be boycotting Google and everything that is related to it. Spread the word.